Athenian general Alcibiades, an Athenian, was born in BC 450 to the Alcmaeonidae family. His father, Clinias, commander of the Athenian army, died in battle in BC 446 in Boeotia. A guardian was appointed for Alcibiades, but he paid little attention to the young boy. Alcibiades became a student of Socrates but when he was 30 years old he left his mentor to pursue a life of political ambitions. In 420 Alcibiades became general and assisted Athens' allies (Argos, Elis and Mantineia) against the Spartans. After the Spartans defeated the alliance, many Athenian politicians and citizens blamed Alcibiades. To regain his reputation in Athens, Alcibiades entered seven chariots in the races at Olympia in 416 where he took first, second and fourth place. Consequently he gained many allies for the Athenians including Thessaly, Achaea, and Argos. A year later, Alcibiades persuaded the Athenians to send a military expedition to Sicily to attack the Syracusans. Alcibiades was chosen to command the force. Just before the army's departure, a number of hermae (busts of Hermes, the messenger of Zeus) were mutilated, and adversaries of Alcibiades quickly seized the opportunity to accuse him of the sacrilegious acts. Alcibiades requested a trial and since his enemies needed to collect more evidence against him, they allowed him to depart for Sicily. Alcibiades arrived in Sicily and began organizing an operation against the Syracusans; but shortly after, he was recalled to Athens. Before reaching Athens, he heard that he had been condemned to death by the city officials, and escaped to Sparta. Alcibiades told the Spartans to send a general to Syracuse and to fortify Decelea in Attica. His strategy led to the eventual defeat of the Athenians in Sicily. In 412 Alcibiades incited a revolt in Ionia. This unexpected action left many Athenian allies in complete chaos. The Spartans accused Alcibiades of being untrustworthy, because some feared he had too much power. He then left for the western capital of Persia, Sardis, but was recalled by the Athenian navy to help their fleet in 411. During the next three years, Alcibiades led the Athenians to several victories against the Spartans in the Hellespont. Believing he had restored his reputation, he returned to Athens in 407. Here he was welcomed and led the procession of the Eleusinian festival. However, once again his old enemies turned the Athenian people against him. Learning of this, Alcibiades retired to a Thracian castle, from where he warned the Athenians of their increasing carelessness regarding the Spartans. When the Athenians lost their fleet to the Spartans in 405 at Aegospotami, Alcibiades sought safety in Phrygia, in Western Asia Minor. He knew the Athenian statesmen would be angry that he had been right about the Spartans. Shortly thereafter, influential Spartans persuaded the Persian governor to have him assassinated. 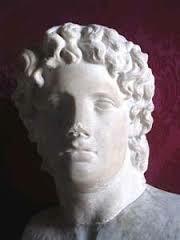 Alcibiades was only 46 years old when he died in BC 404.